Sedona is a hub for northern Arizona entertainment and cultural events. Since it is a short drive either from Flagstaff or Phoenix, the beauty of the surrouding red rocks and mild weather, Sedona is a perfect location for a day or weekend stay. While Flagstaff can be too cold and Phoenix too hot- Sedona is just right. Restaurant dining in Sedona ranges from local small coffee shops to elegant restaurants, steak houses and local fare. Sedona, Arizona was first settled by the prehistoric Hohokam and Sinagua Indians who lived along Oak Creek. In the late 1800s, American settlers arrive to farm the land and raise cattle. The town of Sedona was founded in 1902. Theodore Schnebly named the town after his wife, Sedona. Sedona is famous for its red rock, mountains and spiritual vortex. Now, Sedona is popular among tourists, artists and carftspeople. Numerous galleries and stores feature handmade ware line the streets. 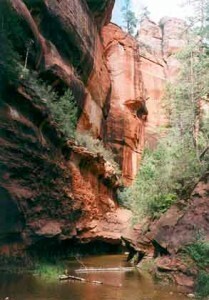 Sedona is also a popular destination for retirement and timeshare investments. At any time of year, Sedona entices visitors with stunning scenery, a thriving arts scene, and a myriad number of outdoor activities. While spring and autumn are the most popular seasons for tourism, a winter visit offers unique advantages. In January, visitors will encounter fewer crowds with which to share the awe-inspiring landscape, a wider selection of hotels and some of the most affordable rates of the year, and an ideal climate for exploring all features of this vibrant area. Sedona experiences an average daily high temperature of 58 degrees and an average low of 33 degrees in the month of January. For visitors, this may translate to days spent comfortably enjoying the outdoors and evenings spent cocooned indoors or cozied around a fire pit with a warm beverage. Hikers will find that unlike during the warmer months, when they must embark on their treks in the morning to avoid uncomfortably hot conditions, the cooler temperatures of January allow them to explore Sedona’s beautiful hiking trails at any time of day. The climate is also well-suited for experiencing other daytime activities, such as golfing, browsing Sedona’s diverse array of shops and art galleries, or admiring the breathtaking scenery from the bouncing comfort of a jeep tour. Although the area only receives snow a few times each winter, some January visitors may be fortunate enough to behold the enchanting sight of the red rocks adorned with snow. However, even when the peaks are frosty, any precipitation on the ground tends to melt quickly, allowing visitors to explore the town unimpeded. Centrally located within the state, Sedona provides an ideal base from which to explore some of Arizona’s most renowned attractions. January visitors who are craving warmer weather can venture two hours south to the lush Sonoran oasis of the Phoenix area, while winter sports enthusiasts can trek an hour and 2,500 feet in elevation to experience the skiing and other activities of Flagstaff. Less than two hours from Sedona is the Grand Canyon; also a feasible daytrip. Unlike the North Rim, the South Rim of the Grand Canyon is open year-round and draws relatively few visitors during January. Without the distraction of heavy crowds, visitors can savor the grandeur of this exhilarating natural wonder with an air of solitude and tranquility that is difficult to obtain during other seasons. In January, average high temperatures at the South Rim are in the 40s, and days are typically sunny, with lows in the teens. However, weather conditions may vary widely at this time of year, so visitors are advised to check the weather in advance of their trip so that they may adjust plans accordingly. Winter hiking at the Grand Canyon may require special gear, as trails could be icy. A city of spiritual renewal, unique artistic appeal, and a mesmerizing landscape of verdant canyons punctuated by vibrantly hued buttes and spires, Sedona will dazzle visitors during any season. Tucked between the frenzy of the holidays and the rush of spring tourism, January promises to reveal a purer and less cluttered Sedona, an unexpected winter gem. For an exceptional destination, an exceptional hotel is required. One premier boutique hotel is El Portal Sedona Hotel, located in the Arts and Crafts District, and a short walk to Main Street. This AAA Four Diamond Hotel offers unpretentious luxury with 12 guest suites, a relaxing, private courtyard and beautiful great room with a river rock fireplace. The inn offers personalized concierge services for guests to get the most out of their journey to Sedona. El Portal Sedona Hotel is a boutique hotel with 12 amenity-filled suites. Unpretentious luxury resonates from this meticulously and accurately created “hacienda.” With a romantic courtyard and beautiful great room, guests can enjoy the serene, ageless spirit of Sedona. It is a pet-friendly, AAA Four Diamond Hotel, voted one of America's Best Pet-Friendly Hotels by Coñde Nast Travelers Readers (2015), and Best Pet Friendly Hotel in the USA by USA Today and 10Best.com (2013). El Portal offers guests personalized concierge services for the Sedona area to enjoy, explore and discover Sedona. Sedona Entertainment and Cultural Events from Red Rock TV. © 1999-2016 EMOL.orgSedona Entertainment Magazine. All rights reserved.